Lyrics Born - The Lyrics Born Variety Show Season 5 On The Floor! Ladies and gentlemen! Boys and girls! All my party people in the house tonight, this afternoon, or this morning; let me hear you make some noise! That’s right waveriders! You’re in the place to be right now because we’re going to talk about the one…the only…Lyrics Born, and his latest mixtape The Lyrics Born Variety Show Season 5 On The Floor! Yes indeed! Comin’ at you correctly! So, if you’re ready to get this party started, read on waveriders! Read on! Phew. Was that too much excitement for an opening paragraph? I apologize. My highly combustible emotions allow me to get carried away rather easily. Can you guess what excites me more than anything else? That’s right! When one of my favorite artists releases something new and ear pleasing it’s as if I have been prescribed caffeinated happy pills. There is a big smile on my face and I start fidgeting with excitement if I have not been able to share the titillating news with the world. So, before I start hitting the wrong keys let’s talk about this mixtape! As the title suggests this is the fifth installment of the Lyrics Born Variety Show. Historically the purpose of the Variety Show releases is to showcase remixes of established Lyrics Born songs, collaborations LB has done with other artists, and previously unreleased music that fans like me eat up. Season 5 puts a unique spin on the proceedings thanks to musical director DJ Icewater mashing LB’s songs together with classic two step and boogie music. The results are stupendously groovy! Seriously, this mixtape is stupidly good! Lyrics Born serves as the MC/ringmaster throughout. This man is a consummate performer. The Variety Shows feel much more like a live performance, and engaging a live audience is something Lyrics Born excels at. Trust me. I’ve seen him do it several times. Can you guess what else Lyrics Born excels at? You guessed it…lyrics. Here is a freestyle he lays down at the beginning of Season 5. There are a few instances (marked with a ?) where I simply couldn’t clearly make out what was said. I apologize for that. The lines that don’t make sense…my fault. That said I think LB’s superb lyricism (in a freestyle no less!) comes through loud and clear. He delivers his verses with a sinuously fluid flow that I find endlessly enthralling. 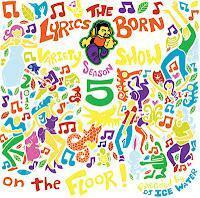 Waveriders, I can’t recommend The Lyrics Born Variety Show Season 5 On The Floor! highly enough. If you’re looking for a wickedly good listen that is guaranteed to make your day better look no further. Oh, and did I mention that this mixtape is free? That’s right, FREE! Follow the link below party people, and prepare to groove! Don’t you love it when artists you like get better in your eyes with every release? I know I do! Waveriders, you might remember an artist named K. Flay from when I wrote about her last mixtape, I Stopped Caring In ‘96. Perhaps you already knew about this dope female emcee before I wrote about her on The Ripple? Either way, if you listened to that mixtape it is quite likely that K. Flay put you under her spell thanks to her undeniable microphone skills and charisma. Today we’re hopefully going to add more fans to the fold with talk of her latest release, the Eyes Shut EP. What we have here is five songs encompassing eighteen minutes of hip hop excellence. In an interview with www.buzzine.com I learned that the increased focus evident in K. Flay’s new music is the result of her limiting herself in terms of what equipment and programs she used to create it. Allow me to say that the new approach has paid off. The five songs on the Eyes Shut EP have a harder edge than her previous works. The drums really punch through the mix, and the synthesizer work often sounds jagged enough to cut glass. Although K. Flay’s previous releases have not been all lollipops and rainbows, this new EP is dark. Its tone is dark vocally and musically. That’s not to say that listening to it will put you in a bad mood, or make you think about hurting yourself. Not at all. Just don’t put on your headphones expecting to hear glorified odes to materialism or a beautiful sunset. Would you like an example? Sure! Here is the first lyrical verse from the song “Sunburn”. Pretty sweet wordplay when written down, but even better when coupled with the song’s impactful music. Waveriders, I strongly urge you to check out this EP. I’ve listened to it many, many times and it has not worn out its welcome. 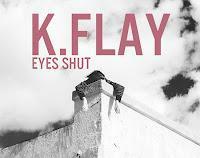 You can get it for free directly from K. Flay herself by following the link below. If you really like it (…and you will!) consider buying it from itunes, amazon, or wherever else it is for sale to lend your support to an up and coming artist. The world needs more from K. Flay. There! It is written, therefore it must be true.